What Happens When Life Starts to Imitate Art? Ten years ago, Oliver was one of seven young actors at Dellecher Classical Conservatory, a fiercely competitive school where the acting students only perform Shakespeare. Entering their fourth and final year, Oliver and his friends come to realize that they always seem to play the same roles on stage and off charming James, hero; cunning Alexander, villain; fiery Meredith, temptress; sweet Wren, ingénue; and Richard, true to his name, the tyrant. Oliver and Fillippa are always relegated to the roles of secondary characters in someone else’s story. But when the casting changes, good-natured rivalries take a sinister turn, and real violence invades the students’ world of make believe. Part coming-of-age story, part confession, and shot through with Shakespearean verse, “If We Were Villains” explores the magical and dangerous boundary between art and life. In this tale of loyalty and betrayal, madness and ecstasy, the players must choose what roles to play before the curtain falls. Read on for an excerpt of this spellbinding new novel. I sneezed as if in response to his question, and there was a brief pause before we began suggesting topics. My classmates exchanged curious glances, unwilling to offer the first hypothesis and risk being wrong. “Well,” I ventured, when nobody else spoke, my voice thick with congestion, “by the end of the play most of the major characters are dead, but Rome is still standing.” I stopped, struggling to articulate the idea. “I think it’s more about the people and less about the politics. It’s definitely political but if you look at it next to, I don’t know, the Henry VI cycle, where every body’s just fighting over the throne, Caesar’s more personal. It’s about the characters and who they are, not just who’s in power.” I shrugged, unsure whether I’d managed to make any part of my point. It wasn’t the sort of question that needed an answer, so no one replied. Frederick was watching me, I realized, with the proud, fatherly affection he usually reserved for James— who gave me a faint but encouraging smile when I glanced across the table. We rummaged around in our bags to find notebooks and pens, and as Frederick carried on, we scribbled down almost his every word. The sun warmed my back and the bittersweet scent of black tea drifted up into my face. I stole furtive glances at my classmates as they wrote and listened and occasionally posed questions, struck by how lucky I was to be among them. 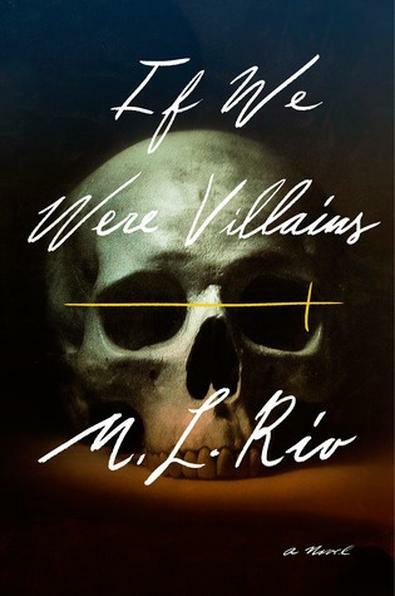 From If We Were Villains by M. L. Rio. Copyright (c) 2017 by the author and reprinted by permission of Flatiron Books. M. L. Rio has worked in bookstores and theaters for years and received her MA in Shakespeare Studies from King’s College London. “If We Were Villains” is her debut novel. For your very own Shakespearean college experience, check out Backstage's guide to 25 amazing acting colleges you should know.